Cerebral blood flow (CBF) was measured in four elderly hydrocephalic patients with dementia with the use of the 133-Xe inhalation method. The patients had no signs and symptoms of increased intracranial pressure. They all had a triad of normal pressure hydrocephalus (NPH) except one patient, who lacked incontinence. Dementia, evaluated with the dementia rating scale by Hasegawa, decreased markedly after shunting procedures in two patients and after removal of posterior fossa tumors in the other two patients. The average hemispheric CBF was subnormal in three patients, and within normal range in the fourth patient before operation. It did not increase when dementia disappeared within 7 to 21 days postoperatively. The mean CBF was 41.4 ml/100 g/min before operation, and 40.8 ml/100 g/min after operation when dementia disappeared. The cerebral circulation time (CCT) was measured by the dynamic computed tomography (CT) in three of them. The mean CCT was prolonged before operation, 13.0 sec, and returned to normal range, 7.5 sec, when dementia abated after operation. This reduction and normalization of CCT reflect an improvement in the microcirculation within the brain. 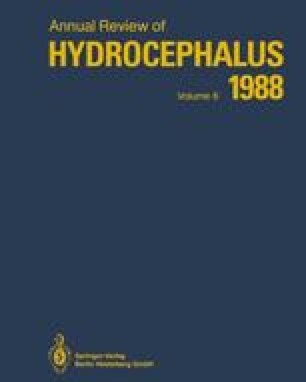 The results of this study demonstrate that disappearance of dementia following surgical intervention in hydrocephalic patients, possibly including those with NPH, is not always accompanied or preceded by an increase in CBF as measured by the conventional method. However, the postoperative disappearance of dementia is accompanied by an improvement in microcirculation which can be measured by the dynamic CT.